Letterboxes from coast to coast! Of all the major changes I listed yesterday, I overlooked one: maps. Most notably, KML files that work with Google Earth. The best way to see this in action is to try it for yourself. You'll need to download and install Google Earth if it's not already installed on your system to follow along with me. Now, when a premium member runs a search for letterboxes, they'll see links for "KML" and "Network KML." KML is a specific file format and Google Earth is probably the best known program that supports it. Super cool stuff. *nodding* The original KML link has been there for years and still works the same as always. 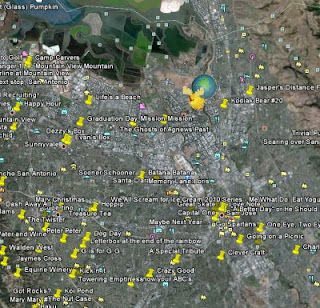 It returns a file with the first 100 boxes that your search matches, and you can zoom around Google Earth to see it. It's a static file, though, and never changes. It's still pretty cool, but has a couple of limitations--the fact that it never updates, and the fact that it will only show the first 100 boxes in your search. The "Network KML" link gets around these limitations by specifying a special URL on Atlas Quest that Google Earth can contact to get the information it needs to display through a feature called "network links." When you click on the link and open it in Google Earth, it doesn't actually contain any information about letterboxes--just where on the Internet to get information about letterboxes. 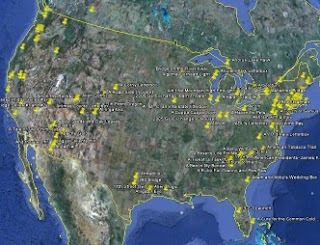 After Google Earth loads the file, it connects to Atlas Quest and says something like, "The view of Earth is currently showing the entire United States. What boxes are there that are within this area?" And Atlas Quest will reply with the first 100 boxes that it finds in the database within the designated area. Zooming into the San Francisco Bay area. If, in Google Earth, you then zoom into California, Google Earth will contact Atlas Quest again and say, "Hey, my owner moved the map, and now it's only showing the area in California. What boxes should I display?" 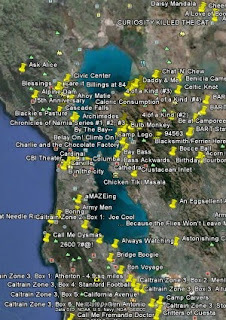 And Atlas Quest will again search through its database and reply with the first 100 boxes that it finds in California. The maximum number of boxes shown in a view is still 100--but it throws out the boxes that are no longer within that view and replaces them with new boxes that are still within the view. If you then zoom in further, such as into the San Francisco Bay area, Google Earth will contact Atlas Quest again. "Hey, AQ, my owner just moved the view again. What boxes do you have that cover the SF area?" And Atlas Quest will give it another list of up to 100 boxes that are within that view. You get the point. So while you'll never see more than 100 boxes listed in any given view, if you zoom around enough, you could--in theory--spot every single letterbox listed on Atlas Quest. And if you save that file and come back to it a year later, it again contacts Atlas Quest for the current boxes that match the search. If a box was deleted during that timespan, it'll stop showing up on Google Earth. Or if the box was moved, it'll move on Google Earth. Or if your search was original set to show only active boxes and a box had been retired, Google Earth will stop showing that box. The results are dynamic and always up-to-date. I zoom in even further, this time to San Jose. Speaking of which... on with my quest to find a way to "correct" the starting point coordinates. What do you think about allowing a special kind of personal "note" or tag within the notes for boxes that could override the posted location in a search like this? Starting 2011 With a Bang!